This is the place where you’ll get meeting reminders, the latest scoop about what’s going on in Smith County, Mississippi, and many other exciting genealogical things you won’t want to miss. Visit often to stay in the know!! Everyone is invited to join us at the Smith County Genealogical Society Meeting on January 13, 2018. The meeting will be held in the Raleigh Library/City Hall Conference Room, beginning at 10:00 a.m.
Susan Reeder, Vice-Regent for Mississippi, Mount Vernon Ladies Association, will be our guest speaker. She will be presenting a power point and talk on Mount Vernon, the beautiful home of the first President of the United States. The December meeting of the Smith County Genealogical Society will be held Saturday, December 10, 2016, beginning at 10:00 a.m with a short business meeting. The meeting will be held in the Raleigh Library/City Hall Conference Room. Everyone is invited. Bring your favorite finger foods, your spouse or a guest, and join the fellowship. The monthly meeting of the Smith County Genealogical Society will be held Saturday, November 12th beginning at 10:00 a.m. in the Raleigh Library/City Hall Conference Room. We will be previewing volume one of the military book and discussing layout for volume two. Members are encouraged to attend and help make the decisions about this book. Visitors are always welcomed to attend. We are truly saddened at the death of one of the Charter Members of the Smith County Genealogical Society, Smith County Attorney Eugene “Gene” Tullos. Not only did Gene contribute monetarily, but gave us access to pictures and stories he had written. He will be greatly missed. Our thoughts and prayers go out to his family. Ms. Susan Reeder, Vice-Regent for Mississippi, Mount Vernon Ladies Association, will the guest speaker for the Smith County MS Genealogical Society on May 14, 2016, and will be presenting a presentation on the home of our first president, George Washington. The meeting begins at 10:00 A.M. in the Raleigh Library/City Hall Conference Room. Everyone is invited to attend. 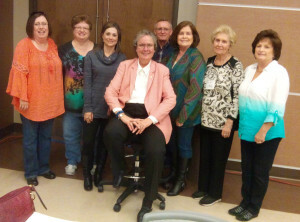 On Saturday, January 30, 2016, we attended a seminar in Pearl, MS, sponsored by the Mississippi Genealogical Society with guest speaker Judy G. Russell, JD, CG, CGL, “The Legal Genealogist”. Not only Ms. Russell’s presentation educational, it was very entertaining. If you ever get a chance to hear her, it is well worth your time and effort. Pictured are Smith, Jasper and Jones County Society Members, Libby Thornton, Susan Blakeney, Kim Richardson, Ms. Russell, Larry Webb, Sarah Gorrell, Carolyn Gilchrist and Charlotte Webb. NEW!!! We now offer our Smith County record books as digital downloads! Below this line are past events, we want you to know the kind of events we have and information we offer. July 13th Meeting with Guest Speaker!! The July 13th Meeting will be held at 10 A.M. at the Raleigh Library/City Hall Conference Room. Our Guest Speaker will be Society Member Jennifer Hutchinson, who will make a presentation, with photos, about her recent trip to Scotland. Everyone is welcome to attend. Lisa R. Franklin, RN, BSN, will be our Guest Speaker for the January Meeting. Lisa is a Registered Nurse with a Bachelor of Science in Nursing degree, as well as a former member of the Society. Lisa began her involvement in genetic genealogy in 2006, continuing to progressive expand this research to a number of her family lines with extensive ties in Smith County, Mississippi. The Y DNA Projects she is currently involved with include the Sullivan’s Hollow, Smith Co. MS FF DNA Project, which includes a large number of families from the Smith County area. We look forward to Lisa’s presentation on DNA research. Anyone interested in tracking your roots with DNA is welcomed to attend our meeting. The Society is pleased to announce that Dr. Bryant Boswell, D.D.S., will be our Guest Speaker for the February Meeting. Dr. Boswell has a B.S. degree from MSU and a D.D.S. degree from Baylor University College of Dentistry in Texas. He was a Captain in the U.S. Army from 1971 to 1974, and he has practiced General Dentistry in Jackson since 1974. His topic will be “The Natchez Trace Parkway, Mississippi’s Gem.” Dr. Boswell is President of The Natchez Trace Parkway Association, has portrayed Private Robert Frazier and Captain Meriwether Lewis in the Bicentennial Commemoration of the Lewis and Clark Expedition, has portrayed a member of the Tennessee Militia and Gen. Andrew Jackson in the Bicentennial Commemoration of the 1813 Return of Jackson from Natchez to Nashville, and is Chairman of the Lewis and Clark Trail Heritage Foundation Living History Delegation 100th and 101th Nation Jamboree, just to name a few of his activities. We are looking forward to this informative presentation by Dr. Boswell. Everyone is welcome to come and join us. Did you visit our Gallery Page? We have shared a small part of our Smith County Photo Collection. There’s a new link on our main menu. Check back often, we’ll be adding new albums to our gallery frequently!